from the official 1975 programme but almost unchanged for each year of the SKOL 6. The most popular of all the events during the SKOL 6. Eleven riders start in the race with an elimination every three laps for the last man across the line. This process of elimination continues until only two riders are left on the track to decide the winner of the race. During the Devil-take-the-hindmost the focal point of the racing is the rear of the field. SKOL 6 sprints are raced over a distance of 10 laps with one rider from each of the eleven teams on the track. Cycling sprints are quite unlike go all the way short distance events of athletics. The riders concentrate all the action into the last few laps. The reason being that a rider taking the lead for a long way, acts as a pacemaker for his opponents and will invariably be beaten by the other competitors who have sheltered in his slipstream and used the front runner as a marker. The tactic of the cyclist sprinter is basically to time the launching of his effort from the front at a point where he knows he can maintain his top speed until the finishing line and hold off the attacks of his opponents. If the rider's speciality is a fast finish and he prefers to ride his race from the rear position, he will try to force the pace using his opponent as an aiming point. Because the action is concentrated in cycling sprinting, the riders in the SKOL 6 will cover the last lap at speeds over 40 mph. On the tightly banked SKOL 6 track sprints are rarely won from further back than sixth position. During each session of the SKOL 6 the winners of the two Devil-take-the-hindmost races meet in a match race. With only two riders on the track, the tactics of cycling sprinting become more apparent, with neither man eager to initiate the action. The task of the leading rider is to dictate the tempo of the first laps to the point at which the sprint will begin. At the same time the rider in the rear position will do all he can to force the pace into an early sprint or take any opportunity to catch his opponent unawares by diving underneath for a surprise attack. The motors used for pacing at the SKOL 6 are French DERNY machines specially built for this type of work. The pacers are ex-professional cyclists and predominantly Belgian. The motors are capable of up to 60 mph. They are pedal assisted on a very high gearing ratio, the traction being necessary for accurate steering on the small tracks. Five riders start in the motorpaced events. The riders draw for starting position and line up one behind the other. On making contact with the motor, the rider obtains as much shelter as possible by riding with his front wheel only a fraction of an inch away from the rear wheel of the motorcycle. 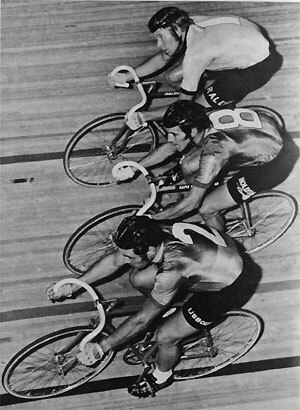 'G' forces in each banking make motorpaced cycling an exacting event. The pacemakers wear helmets with earphones for ease of communication with the rider. It is the experienced pacemaker who decides the moment to attack or defend. Though the pacemakers appear to carry out their task in a leisurely manner, skill and superb timing are essential requirements. The basis of Sixday racing is the teams race, sometimes called a madison or a chase. Basically it is a relay race with one rider in the race at all times while one rider rests by riding slowly on the top half of the track, above the blue line. The aim is to gain a lap advantage over the field. A lap is gained when the team has reached the last man in the field. The lap position of the teams is continuously changing in a fast chase and the spectators' guide to the situation is the electrical scoreboard. On this example of the scoreboard, teams 1 and 4 are level with no laps lost. Team 5 has lost one lap, team 3 has lost 2 laps. Sprints: Winner 5 points; 2nd 3 points; 3rd 2 points; 4th I point. Points Race: First rider across the line each lap receives 3 points for his team, the second rider 1 point for his -team. Winner 15 points, second 10 points. Motorpaced Racing, points for the 10 minute Race 30, 20, 15, 10, 5 — points for the 15 minute Race 20, 10, 5. Prime is the international cycling term for an incentive prize. The primes can be in the form of cash or donated goods. Many are spontaneous donations by the spectators at the SKOL 6. During the evening four delightful SKOL Girls will be around in the audience collecting your odd pieces of silver. A team consists of two riders wearing similar jerseys with the same number on the back. To help recognise the riders, one number is black and the other is white. In the Teams Race (sometimes referred to as Madison or Chase) the riders in the team may relay each other at will. To relay, one member of the team must actually touch his partner. Should a change be missed, the participating rider must remain in the race until he once more comes around to make contact with his partner. If a rider in the race suffers a mechanical defect his partner must join the race in exactly that position in the field where his partner was at the time of the crash or defect. The rider must remain in the race on his own until his partner returns to the track. Should a rider be injured in a crash he may be neutralized by the Race Director, in which case his partner will ride two laps in the race and two laps out. A rider can be neutralized for up to 12 hours. If he is incapable of rejoining the race after that time he will be withdrawn from the SKOL 6. The Race Director can form a new team from two riders whose partners have retired from the race. The number of lost laps and the points totals of the two original teams are added together and divided by two. This will then be the position of the new team in the SKOL 6. In the event of a crash involving more than one third of the field the Race Director may neutralize the race, or if a crash has damaged the track. RED —indicates that the race has been neutralized.